In just four short lessons, 'Go Out & Reach' evangelism is designed to help you share your faith and the Gospel with anyone at anytime. 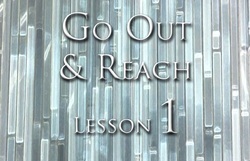 Learn conversation starters, how to over come fear, sharing the Gospel effectively and many more tips and techniques for outreach. Click on the images below to download or open the pdf files. The 'Go Out & Reach' evangelism classes are perfect for small groups or Sunday School.